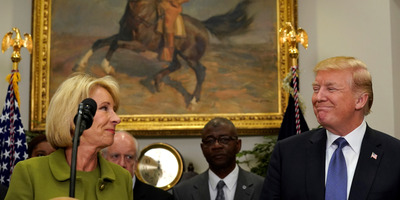 Kevin LamarquePresident Donald Trump has referred to Education Secretary Betsy DeVos as ‘Ditzy DeVos,’ according to former White House adviser Omarosa Manigault Newman. Manigault Newman also accompanied DeVos the following day for an event in Florida, but was apparently ditched at the hotel by DeVos’s motorcade. The former White House adviser claims DeVos called and told her to take an Uber to the event, but she was livid and opted to take one to the airport instead. 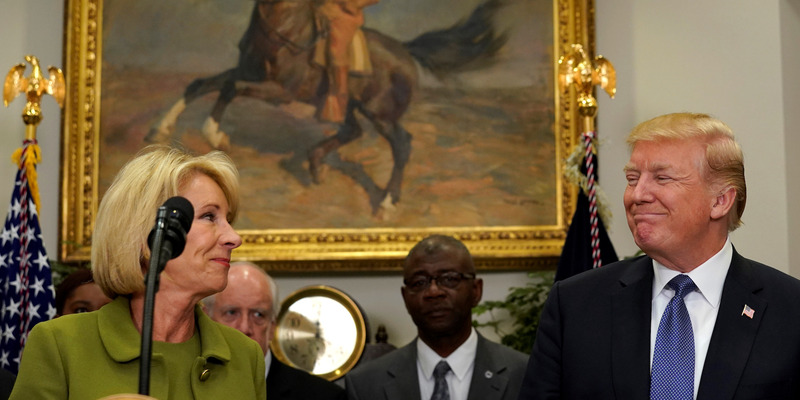 After she returned and gave the president a summary of what transpired, Manigault Newman claims Trump “shook his head in disgust” and suggested he would fire DeVos in the near future. “[Trump] said, ‘She is Ditzy DeVos, what do you expect? In a very short period of time, I will get rid of her. Believe me, believe me,'” Manigault Newman wrote. “The depth and breadth of [DeVos’s] ignorance is a travesty for the children. … She’s woefully inadequate and not equipped for her job. She is just as horrible as you suspect she is,” Manigault Newman wrote. The Department of Education did not immediately respond to Business Insider’s request for comment on the story. Manigault Newman has also already made public statements in the past week that have contradicted allegations made in her book, adding to questions surrounding the credibility of her claims. “Unhinged: An Insider’s Account of the Trump White House” will be released on August 14.